If you are a new customer and plan on using Android devices please register for an iSURVEY account. 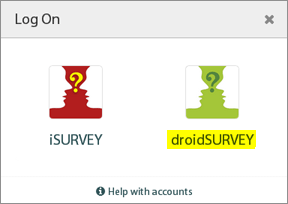 iSURVEY accounts support Android devices running the droidSURVEY app and Apple device running the iSURVEY app. Click here to register for an iSURVEY account and start your free 14 day trial. New droidSURVEY accounts can no longer be registered.